Sensationalist title, but it IS that good. This isn’t my recipe, although i have jiggled around the icing to my taste, but since it is probably the best chocolate cake you are ever likely to eat, I thought it was probably worth posting. The recipe originates from Green’s restaurant in San Francisco – surely one of the best vegetarian restaurants in the world, certainly that I have been to – and has become my go-to celebration cake. 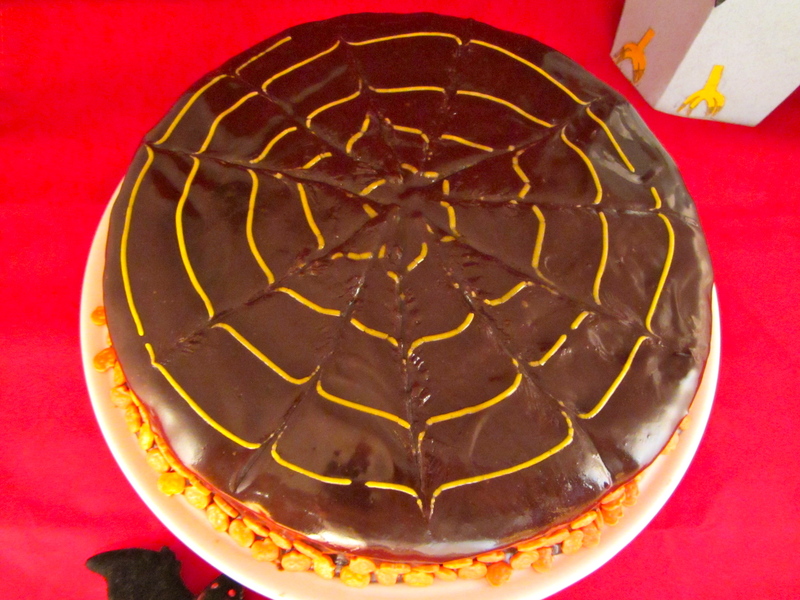 Since it was D’s birthday last week (just before Hallowe’en, hence the spooky embellishments!) it provided the perfect opportunity to wheel out this trusty favourite. 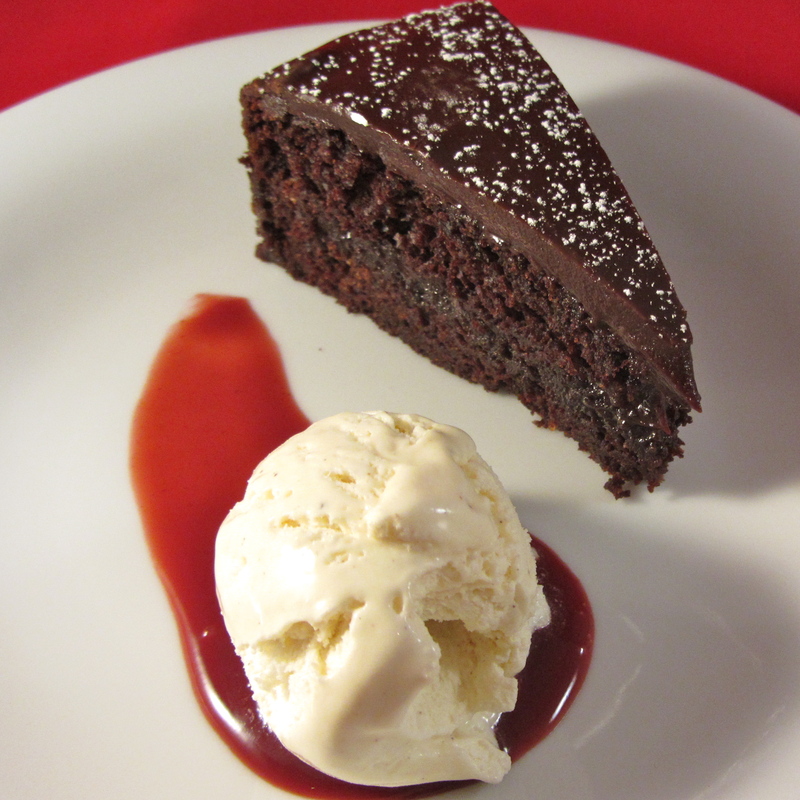 In short, this cake is rich, dark, decadent and deeply chocolatey. 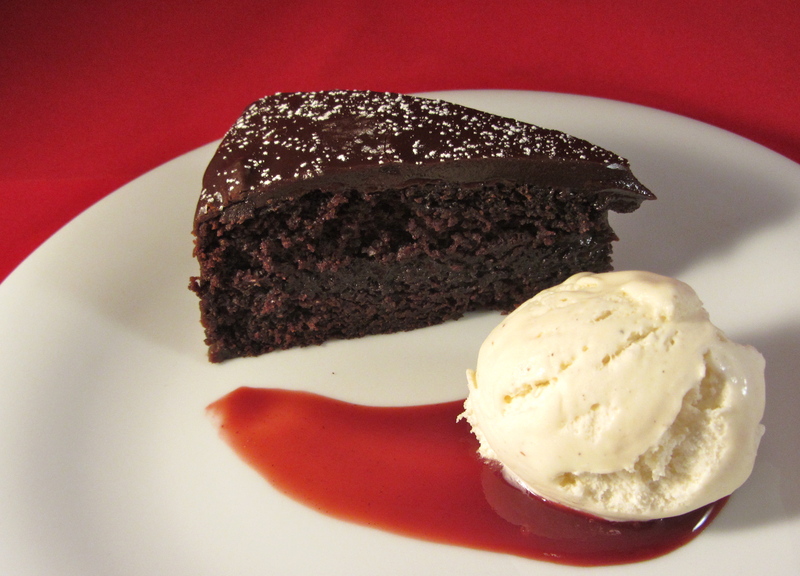 But it remains moist and delicate, and this chocolate icing makes is pretty special – resulting in the perfect chocolate cake. Even D, who is no fan of cake (can you believe it? ), says it’s probably the finest cake he has ever tasted. High praise from a man who grew up with regular access to French patisserie. It can work as a cake to serve out as a slice on its own, but a great pudding with a side of dairy-free ice cream. – Pour into the cake tin and bake for about 1 hour, or until a knife comes out clean. – Cool in the tin, before removing and transferring to a wire rack. – Meanwhile, melt together the icing ingredients and simmer for a few minutes until thick and glossy. Let cool. – Cut the cake in half and spread on 1/3rd of the icing. – Sandwich together the cake halves and evenly spread the rest of the icing over the top and sides. – Decorate if desired and leave to set. This looks fantastic. I wonder how it would take to a gluten free all purpose flour blend? Wow! Ticks sooo many boxes! Thank you!!! I’d love to try making it at home. Your Devil’s Food Cake AKA the Best Chocolate Cake in the World will be a great surprise to my little sister when she come home from Canada. I have no idea what recipe to introduce to her because she love baking and cooking. Thanks for this Devil-Angle recipe! Just wanted to check quantities – do you really mean tablespoons of vanilla, vinegar, baking powder and bicarbonate? I am new to the world of baking with multiple allergies and think the blog is fantastic! Yes I do mean tablespoons – it seems like a lot, but for this cake it really works. Hope you enjoy, it’s one of our favourites! Made this cake and it was spendid. Absolutely delicious. All your recipes are great so no surprise there. I would like to make it again for my son’s 2nd birthday but this time I was thinking of using the icing only for the filling and not on top too. Do you think it will be ok to cover it with white/ivory icing fondant? Like the ones from Dr. Oetker? To make it look like a birthday cake with some icing decoration..
we cant do oat in this house but can do soya. would swapping the oat for soya work? would i need different quantities or like for like?